Starting from the base of the neck, pass the fingers under the skin by cutting with scissors and tendon fibers, up to the thigh.With a sharp knife, cut the duck in half because they can cook evenly. Salt and pepper generously inside and out.Place the goose on a rack or grill pan to come into a (heavy), with the chest upwards.Add the neck, gizzard, heart, and 4 cups of water. Cover with aluminum foil and seal edges.Bring water to a boil, reduce heat and steam for 45 minutes. Allow to cool.Transfer the grid on a tray and keep in the refrigerator (uncovered) overnight, until the skin has dried (it will look like a scroll). Refrigerate the meat juices. Bring to room temperature before arrostire.Riscaldare oven to 180 degrees. Mix honey, Tabasco and the rest of the water (1 / 4 cup).Put the grid in the pan and roast for an hour, brushing occasionally with thisthe compound. Reversing the goose and cook another 30 minutes, continuing to brush. 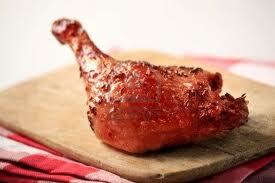 The goose is cookedwhen an internal temperature of 75-80 ° in the thigh. Preheat oven to 70 °, then remove the duck on a tray that can go in the oven and let rest for 20 minutes. For the sauce: Remove the fat from the pan for another use while retaining the part that issolidified, pour the juices released from meat during rest and bring to a boil deglaze.Add the starch to thicken and quickly.Season with salt and pepper and put in a gravy boat. Serve the duck with the sauce.